Upgrade your ethnic wardrobe with this gorgeous maxi tunic featuring a floral printed bodice, flared cobalt blue bottom, short sleeves, high slit and concealed zip closure. Work It - Looks ultra-glam with cigarette pants, barely there heels and statement earrings. 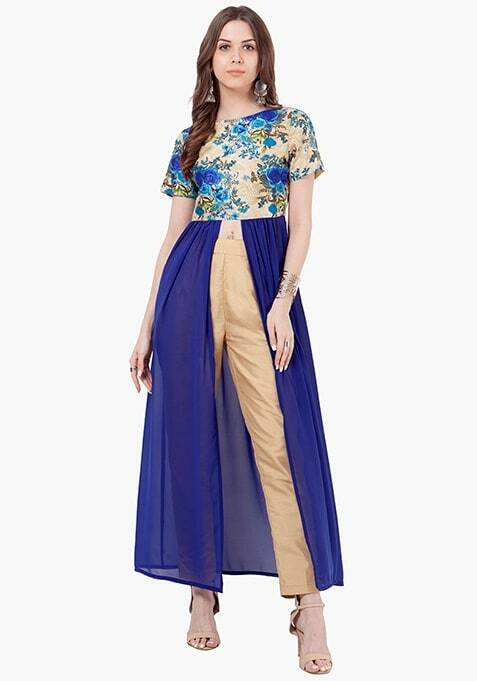 Material: Silk bodice, georgette bottom, shantoon lining High slit on the front Short sleeves Concealed zip closureLength: 54"